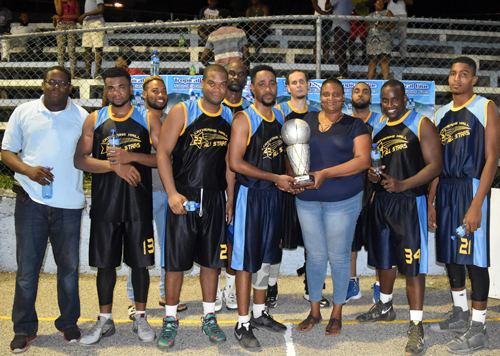 The elasticity and crisp shooting of Michael Schloss were on display as Catherine Hall All Stars proved the doubters wrong and stunningly re-wrote the form book to hoist the 2018 edition of the Western Basketball Association’s (WBA) Elite League title. All Stars, with a solid team effort and a breath-taking 37 points from Schloss, destroyed the in-form MoBay Cricket Club Knights 85-80 in the second and decisive game of their best-of-three series to triumph 2-0. Schloss, who tip-toed around the court in the early part of the contest, dominated in the latter parts, with his slashes and knee-dropping crossover dribbles in guiding the All Stars to their second hold on the title in four years. The championship affair also marked the first time in four years that the dethroned champions, Granville Jaguars, were not in the contest for the title. All Stars cantered into the ascendancy and made their intentions to claim victory clear from the get go, storming to a 15-2 and 22-6 advantage against the usually slow-starting Knights, who this time failed to recover, crashing in sensational fashion. The Goyan Malcom-captained All Stars opened up a solid 28-15 lead at the close of the opening quarter and though the Knights rallied, outscoring them 26-20 in the second quarter, they still went into the break down by seven, trailing 48-41. Knights again continued their rich scoring form into the third quarter, dropping another 26 points on the back of a couple of a timely three pointers from Omroy Kerr, Ralique Grant and Antonio Spence. They, however, failed to put a strangle hold on the All Stars’ shooting and slipped further behind. Antonio Spence and Jhuan Bryan each missed sitters for the Knights, most of them uncontested lay-ups. All Stars wobbled a bit and twice allowed Knights back into the contest, but after twice cutting the double-digit deficit to a single point, the Knights failed to hold on and were condemned to the beating. Flamboyant with his skills and outrageous with some of his dribbles, Schloss, who at one stage of the third quarter left his former schoolmate and friend flat on his backside with a deft crossover dribble to the delight of the fans, was assisted by Vaughan Corke who added 19 points and snatched 13 rebounds. The two were the only ones to get into double figures. For the Knights, a battling Antonio Spence led the way with 23 points and snatched 9 rebounds while Kerr, who had a good playoff performance in the shooting department, closed out what could be his last campaign with 18 points, 6 rebounds and four steals. An obviously tired Captain Jhuan Bryan, who willed his way to the final whistle, laboured to a double-double, 13 points and 13 rebounds. Ralique Grant contributed 10 points and also had 8 assists.